This 18-hole course, designed by H. M. Brazeal along the Intracoastal Waterway, features ocean views. Hardwood forests and saltwater marshes also characterize this South Brunswick Island layout. The first two holes and the last two play along the waterway. 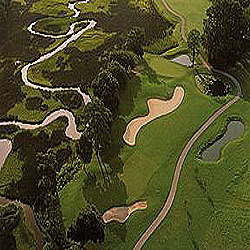 Four holes on the back nine are adjacent to Sauce Pan Creek which is a saltwater marsh filled with wildlife. Practice facilities including putting greens, practice bunkers, a wide driving range with target greens and instruction.